These sobering statistics are the entire reason the Fit & Fall Proof™ fitness program was created. Fit and Fall Proof™ is designed to help senior citizens prevent injuries and the subsequent loss of independence. 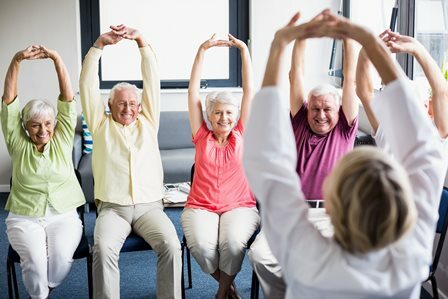 Class participants learn simple exercises to increase strength, balance and endurance, which can help prevent the accidental falls and tripping sometimes associated with age. Click here to download the current 2019 All-Site flyer. 5301 E Warm Springs Ave. Corner E Chinden & N Meridian Rd. Mon/Thurs at 9:30 a.m. & 10:45 a.m.
Tues/Thurs at 9:00 a.m. & 10:00 a.m.